North Carolina is home to 28 bird of prey species, ranging from large eagles to small, lightweight kites. The varied habitats and small wildlife attract many birds of prey to the state. Using sharp eyesight and flying abilities, most birds of prey are efficient and deadly hunters, often attacking from above or taking smaller birds in flight. The state has two vulture species: the turkey and the black, but both are mainly scavengers, not hunters. North Carolina is home to nine species of owl. The largest is the great horned owl which grows to 26 inches in length with a 62-inch wingspan. The state's smallest owl species is the northern saw-wheat owl. It grows to 8 inches in length with a wingspan of 21 inches. The eastern screech owl is almost as small, but has a slightly longer wingspan. The other owl species in the state are the snowy, barn, barred, burrowing, long eared, and short eared. The state is home to two species of eagle, the bald and the golden. 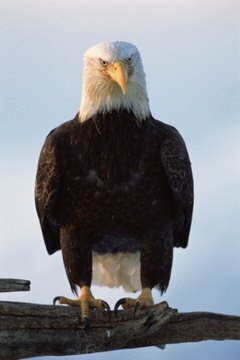 The bald eagle is the larger of the two, growing to 35 inches in length with a wingspan of 90 inches. It is an endangered species that is steadily coming back in population numbers. The golden eagle grows to 33 inches in length and has a slightly shorter wingspan of 87 inches. Unlike the bald eagle, the species is generally common throughout much of its range. North Carolina is home to nine species commonly referred to as hawks. The largest native hawk species is the osprey, or fish hawk as it is sometimes known. It grows to 26 inches in length with a wingspan of 67 inches. The state's smallest species is the sharp-shinned hawk. It grows to just 13 inches in length with a wingspan of 26 inches. The other native species are the broad-winged, Cooper's, northern goshawk, red-shouldered, red-tailed, rough-legged and Swainson's hawks. The state is home to eight other birds of prey that tend to be among the smallest. Three species of kite can be seen in the state including the swallow-tail, white-tailed and Mississippi species. North Carolina is also home to four falcon species including the peregrine, gyrfalcon, merlin and the American kestrel. The northern harrier is also present in the state and is a small hawk known for flying in circles as it hunts and having an owl-like face.